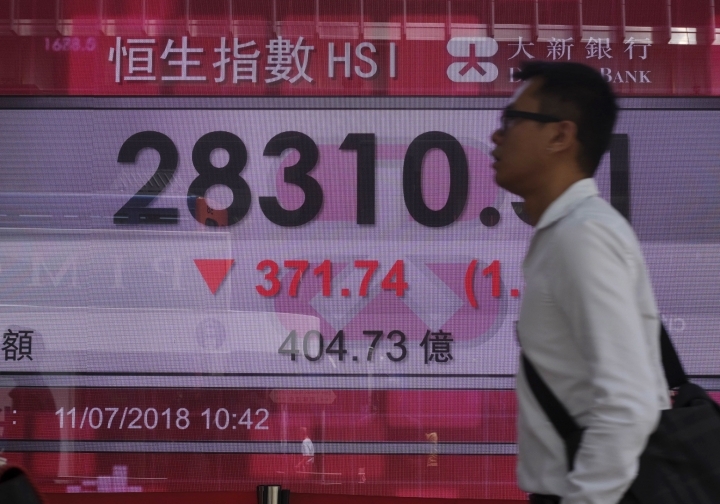 SINGAPORE — Global stocks tumbled Wednesday after Beijing hit back at U.S. plans for tariffs on $200 billion more Chinese exports, with tensions rising over the trade war between the world's two largest economies. KEEPING SCORE: France's CAC 40 lost 1.2 percent to 5,368 and the FTSE 100 index of British shares dropped 1.2 percent to 7,600. Germany's DAX sank 1.3 percent to 12,440. U.S. indexes are set to open lower after a stretch of gains. Dow futures lost 0.9 percent and the broader S&P 500 futures shed 0.7 percent. 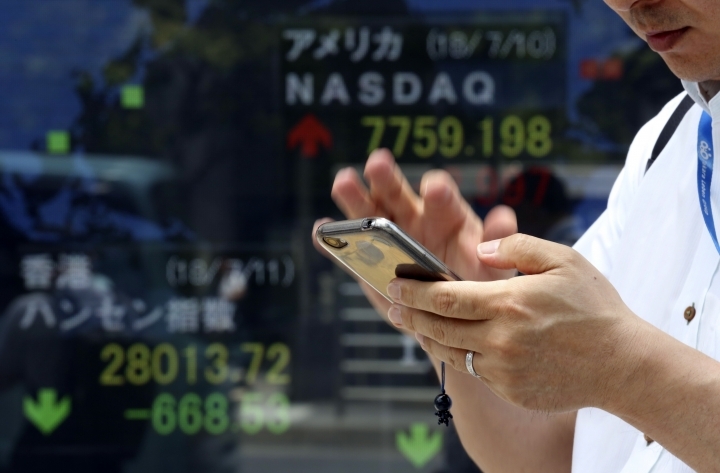 ASIA'S DAY: Japan's benchmark Nikkei 225 fell 1.2 percent to 21,932.21 and South Korea's Kospi lost 0.6 percent to finish at 2,280.62. 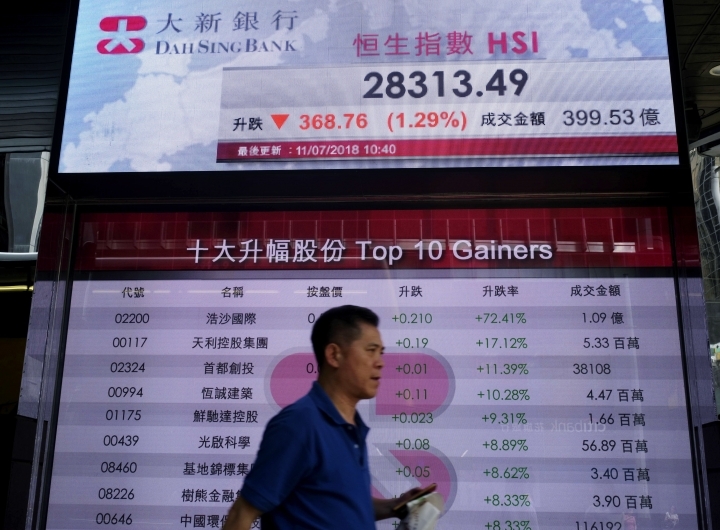 Hong Kong's Hang Seng shed 1.3 percent to 28,311.69. 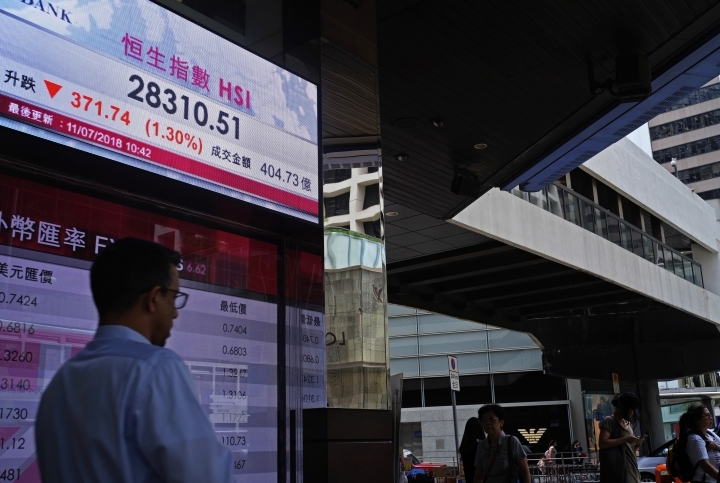 The Shanghai Composite index tumbled 1.8 percent to 2,777.77. Australia's S&P/ASX 200 dropped 0.7 percent to 6,215.60. MORE U.S.-CHINA TARIFFS: The U.S. Trade Representative said Washington is preparing to impose 10 percent tariffs on another $200 billion in Chinese imports, including 6,031 product lines ranging from burglar alarms to electric lamps and fish sticks. The office will take public comments and hold hearings on the plan before reaching a decision after Aug. 31. China's Commerce Ministry called the new wave of U.S. tariffs "totally unacceptable" and vowed to protect its core interests. The ministry did not offer more details, but Beijing had earlier threatened "comprehensive measures" if more tariffs were imposed. The moves followed an initial raft of 25 percent tariffs announced Friday by the U.S. on $34 billion in Chinese exports, which was reciprocated by China. ANALYST'S TAKE: "Given the magnitude and breadth of the tariff list, the impact is expected to ripple through supply chains and cause collateral damage on regional economies," Zhu Huani of Mizuho Bank said in a commentary. However, she noted that the public consultation period allows time for more negotiations. SKY BATTLE: Shares in London-based pay TV operator Sky Plc were up 1 percent at 15.16 pounds after 21st Century Fox increased Wednesday its bid for the 61 percent of the company it does not already control. It raised its bid to 14 pounds ($18.58) a share, which is 12 percent higher than the last bid from rival Comcast and values Sky at 24.5 billion pounds ($32.5 billion). The share price increase suggests some investors believe Comcast could launch a higher offer in return. ENERGY: Benchmark U.S. crude dropped 68 cents to $73.43 a barrel. It gained 0.4 percent to settle at $74.11 a barrel in New York. Brent crude, used to price international oils, lost $1.90 to $76.96 per barrel. 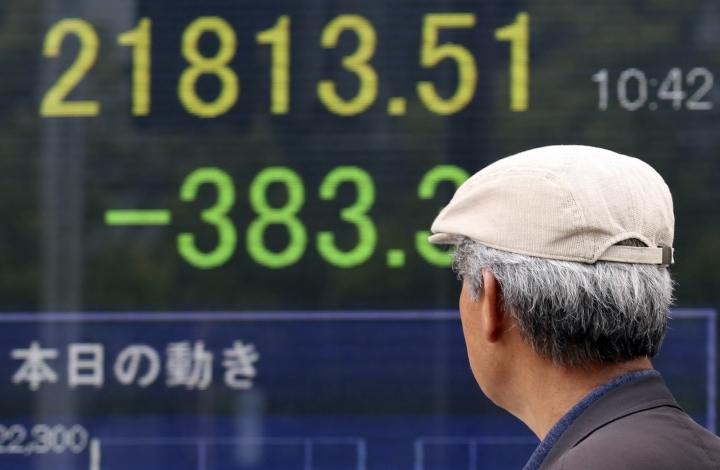 CURRENCIES: The dollar eased to 111.23 yen from 111.28 yen on Tuesday. The euro weakened to $1.1707 from $1.1745.